Going on a trip with a dog may be a new and challenging experience for dog owners. The characteristics of the dog breed and their training influence this type of experiences. As a dog owner, you may wonder if your dog is well-suited for traveling or if it is better to leave your four-legged friend home. The owners of Pomsky puppies are proud of their amazing characteristics. If you have a Pomsky, don’t be surprised to find out that he has some affinities for trips. The Pomsky was created to achieve a breed with the best characteristics of the Pomeranian and the Siberian Husky. Pomskies inherited the watchdog trait from their Pomeranian side and the good-natured disposition from their Siberian Husky side. Every Pomsky is different and displays different personality traits. As a mixed breed, their individual traits and health status depend on their potential for genetically-based diseases down the line. Their temperament is hard to predict as it depends directly on the dogs’ genetic makeup. Although their personalities are unique, Pomskies tend to bark rarely, behave perfectly and love to cuddle up next to their owner. They obey their owners’ commands and love them unconditionally. Pomskies are highly intelligent, friendly, trainable, fiercely loyal, easy-going, energetic, loving and cute dogs, with a good nature and disposition. However, they may be mischievous sometimes. They are great family dogs and very good to have around children. They are better suited for homes with adults and older children. Pomskies are highly protective, just like their Pomeranian parents. They are good guard dogs and tend to become yappy around other dogs or strangers. They are playful and love to spend time with their owners, looking for their attention and affection. They tend to have a favorite human, creating a special bond that requires more time and attention than other breeds. The breed is also known for being energetic. Without enough exercise and mental stimulation, Pomskies can become destructive. Long periods of inactivity can lead to frustration and destructive behavior, chewing up things around the house. That’s why a Pomsky needs an active lifestyle. Both Huskies and Pomeranians are known for their above average intelligence, so Pomskies are pretty bright and very trainable. They are eager to please their owners and feel motivated to learn new tricks and commands. They can also inherit their parents’ stubborn trait, too, so they need to be trained properly and socialized very early. If Pomskies are taught basic things right from the start and their training starts since puppyhood, they learn how to behave and interact with other dogs and people. This way, they become happy and well-adjusted dogs. Beyond their interesting personalities and physical characteristics, Pomskies are great companions, especially when it comes to traveling in colder climates or during cold seasons. Both of their parents love cold weather, so Pomskies are ideal companions for trips in cold climates. They are the happiest when playing in the snow. They love cold temperatures as they have thick coats, specifically designed to keep them warm in cold climates. Both the Pomeranian and the Husky have a double-coat of fur that insulates their bodies from harsh winter climates. They shed twice a year, in the spring and fall, blowing out the fluffy undercoat that protects them from cold in the winter and keeps them cool in the summer by acting as an “air conditioner”. If you take your Pomsky on a trip during these periods, make sure to pro-actively groom him on a regular basis. It is advisable to not take your Pomsky on long trips during the summer. His body and coat are not designed to live in full-time heat. If you don’t use the air conditioner, your pup may become overheated. If you are going to travel by car, make sure you get your dog accustomed to the car. Let him sit in it and take short rides around the town. It is essential to keep your car ventilated to avoid overheating during trips. Also, take a break every few hours for potty and exercises. Avoid leaving your dog alone in the car. If you are going on a long trip, take your dog for a long walk before the departure. If you are going to travel by plane, make sure you are up-to-date with the airline’s pet policies and you have on hand all the required documents. Most airline companies allow keeping pets in a carrier in front of your seat. If you are going to travel by train, bus or boat, find out the policies as some companies don’t allow pets. Pomsky is an energetic breed and may become anxious during the trip. It is a good idea to take your Pomsky for a walk, let him play with his favorite toys or find other activities to consume his energy. Pomskies have an athletic structure, they are fast runners and high jumpers, so they enjoy a great variety of outdoor activities. As soon as you arrive at your destination, you may take some time for playing, walking or running with your dog. Traveling with a well-socialized Pomsky may be a real joy and fun if you follow these recommendations. Author Bio: Troy works as a Marketing Specialist for PremierPups.com. 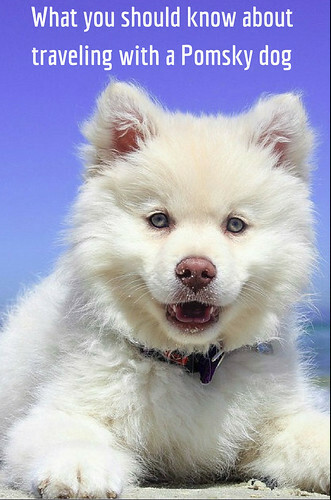 Premier Pups mindfully selects puppies from reputable breeders in USA and provides their customers the most adorable Pomsky puppies, Yorkie, Maltese, Morkie, French Bulldogs, Cavachon, Mini Goldendoodle, CavaPoo puppies for sale. He looks forward to sharing his love for pets with you through the agency. Anyone who knows him, knows how much he loves his dog, whom he rescued from a shelter a few years ago.